It’s time for New Year’s resolutions, and my suggestion to Houstonians for 2011 is to get out of your comfort zone when it comes to food. Food, of course, is all about comfort, and there’s nothing more frustrating than spending your hard-earned money on a dismal meal. For that reason, we tend to stick with our tried-and-true when it comes to dining out. That’s understandable. On the other hand, Houston is blessed with one of the most diverse food scenes in the country, and eating at the same places every day is simply untenable for anyone who wants to enjoy and soak up everything that our great city has to offer. But it’s hard to find new, good places to eat. With that in mind, I’ve put together a list of “food streets” in Houston that offer great opportunities for food exploring in 2011. The concentration of good eats on these streets should provide a higher likelihood of finding new and interesting food. As with any new and different experience, exploring good food and restaurants requires patience, common sense and an open mind. You may find some places where no one speaks English and the menu is written entirely in a foreign language. In this case, you can just look around at other tables and point to dishes you find interesting. In most cases, the staff and fellow diners are friendly and accommodating — sometimes you’ll even find another diner willing to translate. Similarly, you may walk into a restaurant that seems unsanitary or just “off.” In that case, I ask for a to-go menu and vow to come back later, if warranted. You can always check the Houston Health Department’s website, houston.tx.gegov.com, for a restaurant’s inspection record. With those brief tips in mind, here are few food streets that you should resolve to explore in 2011. Felice anno nuovo e buon appetito, feliz año nuevo y buen apetito, bonne année et bon appétit, happy new year and good eating in 2011. I call this the “granddaddy” of Houston’s ethnic food streets, as it has been a destination for Houston food explorers for decades. Anchored to the west by some of the city’s best Korean restaurants and to the east by Vieng Thai, arguably Houston’s best Thai restaurant, this street includes a huge variety of taco trucks, carnecerias, flea markets and specialty food shops. The intersection at Blalock is particularly fertile: check out Korea Garden (fun grill-it-yourself joint) and the massive Super H-Mart, a Korean supermarket where the food court has some of the most authentic and tasty Korean food in the city. 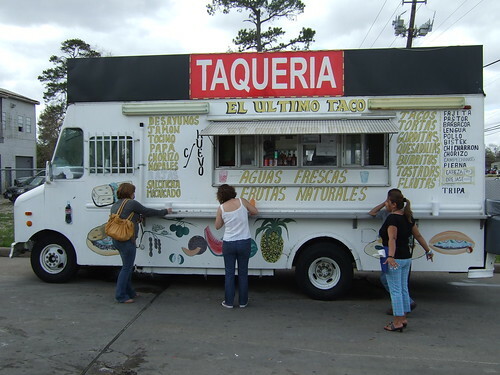 Antoine is the usual location of El Ultimo taco truck, known for great tripa and chicharrón tacos. Further east, in the same strip center as Vieng Thai, is El Hidalguense, known for its open pit grill used to cook tasty cabrito (goat). AIRLINE DRIVE between the North Freeway and West Gulf Bank. If there is a wild west of Houston ethnic food, it’s this stretch of Airline north of the North Freeway. Starting in the north, the giant Sunny Flea Market harbors innumerable stalls for tacos, elotes, and the mysterious chicharrón tostada. 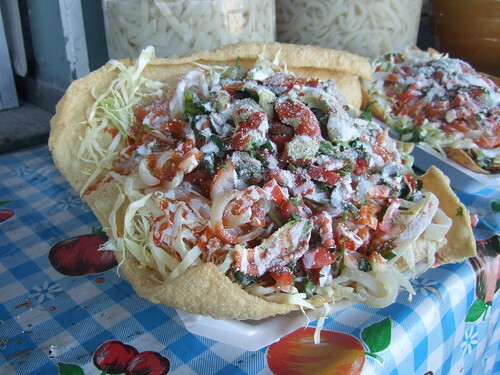 This tostada features shredded cabbage, pickled pork rinds, tomatoes, avocados and a red sauce all cradled in a large (and edible) slab of fried pork skin. Even friends that are eminently knowledgeable about Mexican food debate the origins (and official name) of this dish, and the taste is unique to say the least. Across the street, Buey y Vaca is a Houston institution and raucous shrine to Mexico-style tacos. Further south, past untold numbers of taco trucks and food stands is Tostada Regia, a family-friendly joint featuring more traditional tostadas (crispy corn tortillas and toppings) from northern Mexico. HILLCROFT AVENUE between the Southwest Freeway and Westpark Tollway. This short length of Hillcroft (it can be walked) is jam-packed with the city’s best South Asian and Middle Eastern restaurants and shops. The shopping center at the Southwest Freeway intersection features two of Houston’s best Indian restaurants: Himalaya (Indian-Pakistani cuisine) and London Sizzler (British-style Indian cuisine). Further north, Bijan Persian Grill offers a more upscale taste of Persian (Iranian) cuisine, while Darband Shish Kabob has been serving inexpensive, delicious Persian food in a spartan yet lively dining room for many years. Across the street is Shri Balaji Bhavan, arguably Houston’s best south Indian (vegetarian) cuisine. TEXAS 6 between the Katy and Southwest freeways. A relative newcomer to the local food scene, this wide stretch of highway in far west Houston is the main artery for a surprisingly diverse suburban neighborhood. Toward the north, funky bars like Paul’s Boat and The Dam Ice House serve up lots of cold beer and local flavor. Further south, Tortas Las Llardas offers a large menu of tortas, or Mexico-style sandwiches. Mr. Trompo serves Monterrey (Mexico) style cuisine, specifically tacos made from meat grilled on a trompo (a rotating, upright roaster). 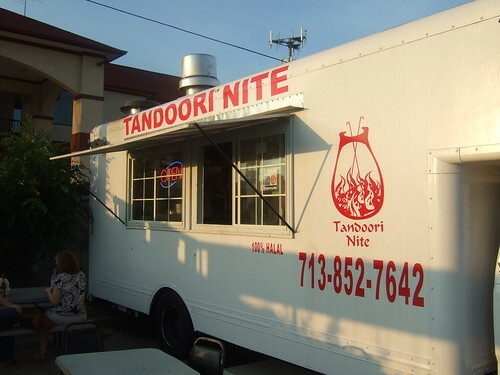 The Tandoori Nite food truck sits in a gas station parking lot near the intersection at Beechnut and serves up some of the best Indian-Pakistani street food in Houston. BELLAIRE BOULEVARD between South Gessner and South Kirkwood. Fu Fu Cafe for exquisite soup dumplings, Sinh Sinh and Jasmine restaurants for great Asian/Vietnamese/Chinese, and Umai for some of Houston’s best non-sushi Japanese food. For a truly different dessert experience, head over to Juice Box or Star Snow Ice for traditional Chinese/Taiwanese concoctions featuring a fluffy pile of shaved ice drenched and topped with ingredients such as tapioca, coconut milk, grass jelly and fruits. This blog entry was originally posted 23 December 2010 on the www.29-95.com website. This entry was posted in 29-95, Food, Houston Chronicle, Lists, Print and tagged airline drive, bellaire, hillcroft, long point, new chinatown, new years, resolution, vieng thai. Bookmark the permalink.